Twigs snapped under fur-lined boots crunching in the snow. Our breath slipped between our lips and frosted white as we wandered among the pines. We didn’t need to see our fingers and noses to know they had long turned red. They seemed to mimick us, ripe with the freshness of our tender connection. I don’t know if I would have made it through that day without you. You rooted me into the earth. I pitched you toward the peak. I admired your hard courage and you my wild morale. Something about the ruggedness of the air helped us to access, through each other, qualities we couldn’t easily find in ourselves. The marriage of our souls was a gift from desperation to deliverance. The Two of Cups reveals itself like a call to arms in the service of unity. As we set intentions on Thursday under the Capricorn New Moon, we are asked to merge the pieces of ourselves that feel like opposing forces. Currently, the energy of the astrological plane is weighted to one side, forming a fierce T-square in the Cardinals; Capricorn, Libra, and Aries. The only guy missing from this party is Cancer but don’t worry – he’ll get his share of champagne. Astrology follows laws of equilibrium and when the planets create this kind of alignment, they tend to send energy shooting into the missing link. 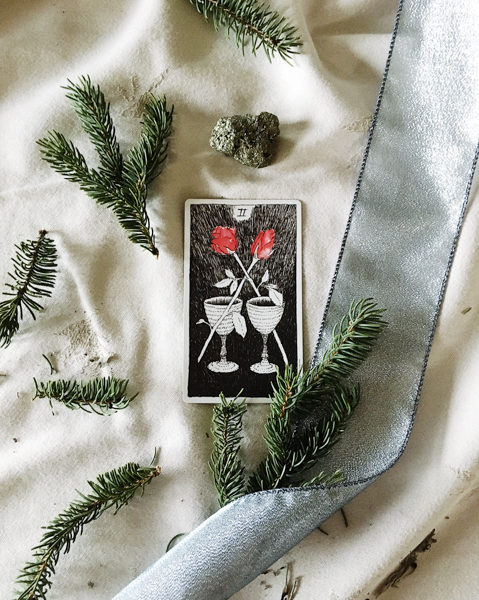 Like a magnet built for balance, the Two of Cups asks us to look at the people, places, skills, tasks, wants and needs that seem to squabble, and to nudge them gently to join in solidarity. What part of your life is getting all the attention? Which spheres feel slighted? This week’s astrology is tailored to make use of the areas in which we feel energized to attend to those that have been neglected. The Two of Cups is a lighthearted launch into union. Tip your hat to the house in your chart containing Cancer and use Thursday’s new moon to lay the foundation for the most dazzling shell this crab has ever seen. You can be sure his home will light up as the moon waxes into radiance.